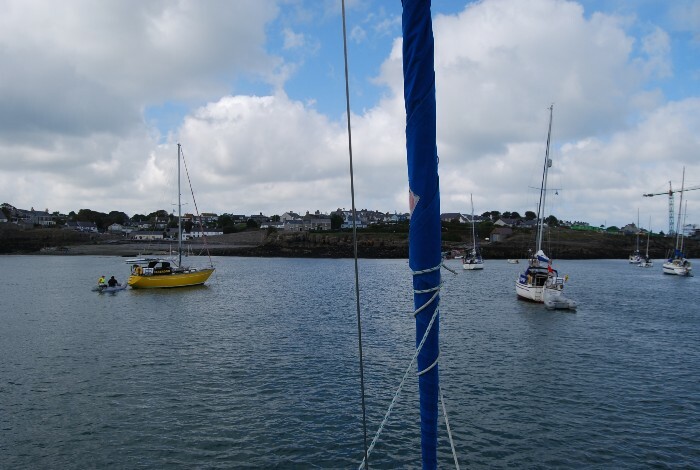 The NWCC had organised a day trip to Moelfre which would take me at least 5 miles further up the North Anglesey coast then we've ever sailed in that direction before. New ground and the forecast looked relatively good; a F3/4 from the NW or N.
I took the train straight from work to Conwy. Sadly the new anchor chain had arrived and I felt the need to transport the 15 kg of iron in addition to my 2 peddles and sail sack. Three stops and one arm six inches longer than the other was the result of the walk from the railway station to the jetty. The briefing was in the club an 21:00 by Steve Gorst, the sailing captain. 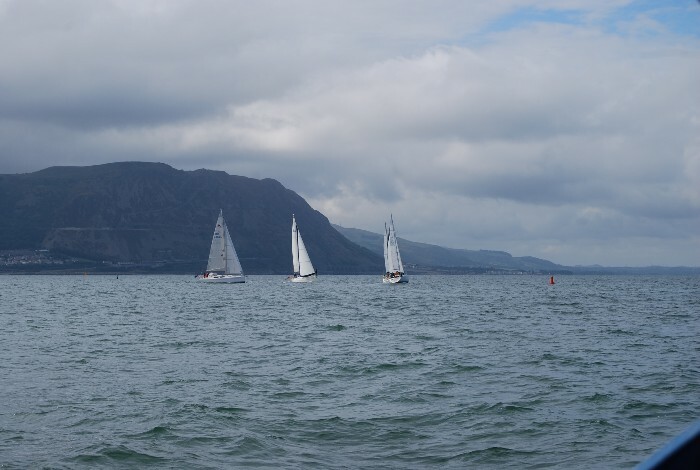 The plan was to leave the moorings at 09:30, gather at the C1/C2 buoys at about 10:30 which would be the start point for a race to an yellow outlet marker near Moelfre. I was in doubt whether to solo sail or join Paxi for the sail. Paxi had a dirty bottom (barnacles), but it would a long trip on my own and anchoring in anything but settled weather would be my worry. I woke up at 08:00 to prepare the boat. The old anchor chain was firmly rusted to its shackle and not possible to replace in time. Steve called on the radio and proposed to join me, which settled the question of the night before. There were some problems with the harbour launch so the start was delayed by 15 minutes to 09:45. We motor sailed to C1/C2, but then noticed that Paxi was well behind and did not respond to any of our radio calls, text message or phone calls. We decided not to use flares yet. The field disperses. Puffin and Moelfre in far distance. Steve started the race via the VHF and we lingered for a bit, but eventually Paxi called, stating that they were doing 1.2 kts. With the 30 NM ahead of us, that would mean a 25 hours sailing trip. Something was wrong with their boat. The wind was a F3 from the NW, which means, as usual, right on the nose. We tacked North for a while to be ready to clear Puffin and work ourselves to Table Road. 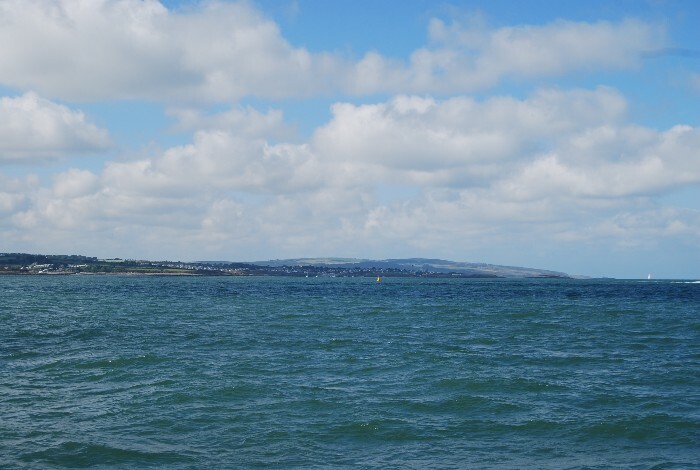 The sea was awfully bumpy in the shallow water and coming from direction of Northern Ireland. Near Puffin I started to feel a little queezy and was hoping Steve would not ask to prepare a Sunday roast as it would probably be served with a side dish. I was not the only one, as 2 other yachts decided to head for Beaumaris, in the shelter of Anglesey. 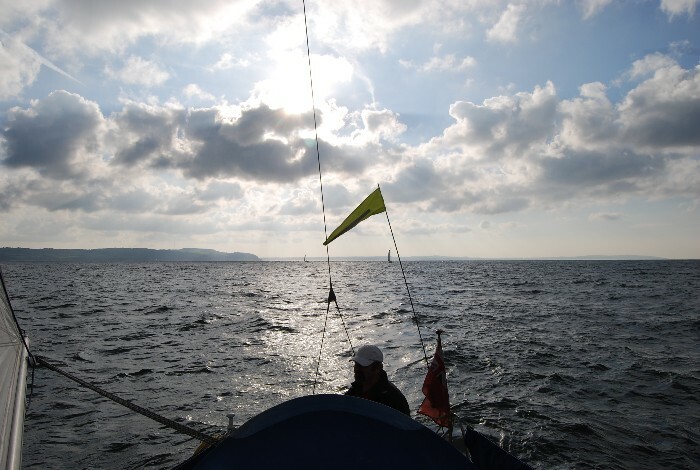 We passed Redwharf bay on port and worked ourselves towards the yellow marker buoy. When passing due East, the race would be over, which we did 14:35. 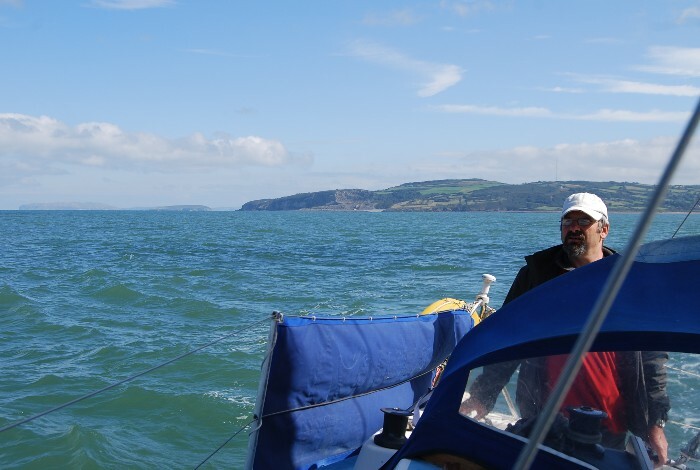 From the yellow marker buoy we switched on the engine to do the last mile upwind and anchor between the other yachts near Moelfre. 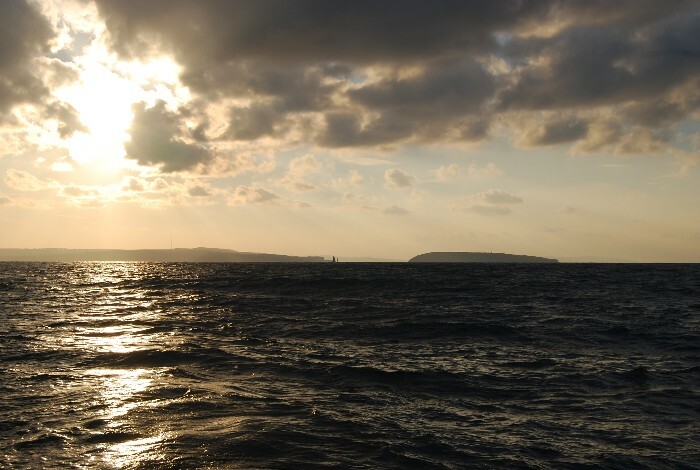 We had done 20.4 NM when we dropped the anchor. Every now and the we watched the horizon for the red sails of Bob's Nobby, which were visible most of the day, still appearing to make its way to Moelfre. For Bob it would be a day trip "not to Moelfre". Which was not unique as he later confessed to have sailed on another trip "not to Holyhead". At 16:00 other yachts started to weigh their anchors to head back. We did so at 16:10. The route back was mainly on a broad reach and we found the easiest course was where both main and genoa just filled with wind (instead of the main preventing the genoa filling). That took us nicely North of Puffin, after which we set course on a run towards Fairway. Near Fairway (19:00) the wind died back a bit and the help of the engine was called in after another yacht passed us stating that "they had given up". 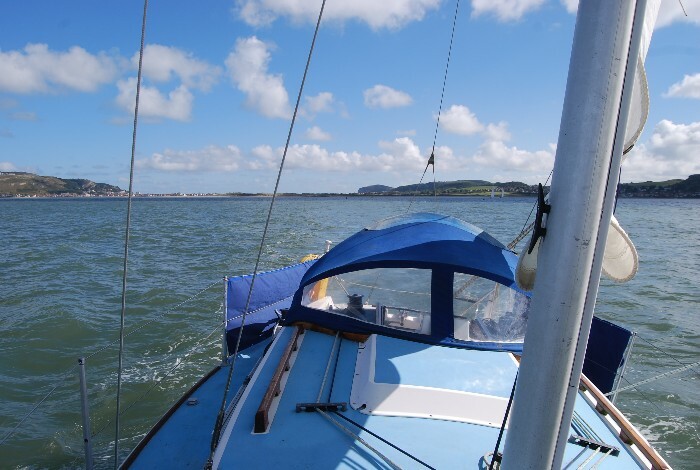 All the time the tide was pushing us back in, and inside Conwy river we made close to 8 kts. Usually when sailing into Conwy river we struggle in against the current. It was a strangely confusing experience and I suddenly found 6 yachts steaming stationary towards me at an incredible 15km/h. A quick turn of the tiller avoided a pile up and embarrising Mayday in sight of the mooring. We moored up in Conwy at 20:00. The club was providing the evening meal and obviously a drink which was well deserved after 10 hours on the water. I slept solidly from 23:00 to 09:00 the next morning. So the plan was to first have a primitive breakfast and then some pottering on the boat, working on a plan for renewing the electrics. At 10:00 however, I decided to go out for a sail, to test the auto pilot and take the train at 12:35. There were no more decent trains later that day, unless waiting 3 hours on a railways station is considered pleasant past time. I had no anorak anyway. "Anyway", that's a good name for a yacht. 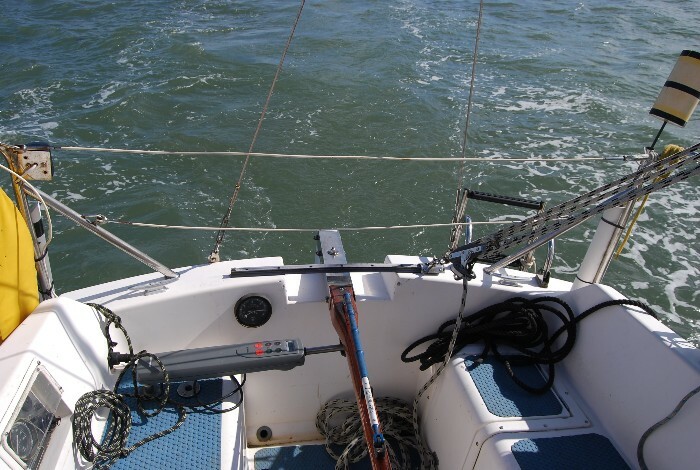 The auto pilot worked well, keeping a straight line in the channel, giving me time to clear away the fenders and later keep the boat in the wind while hoisting the sails. 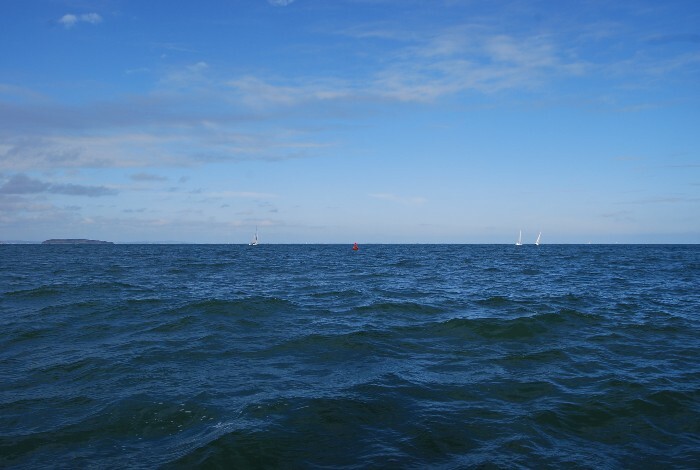 With a fresh breeze (F4) from the North, I set off heading West racing at 5 knots under 1 reef. At 11:20 I started heading back, still thinking I had plenty of time. The next time I looked at the clock, it was 11:45, giving me 45 minutes to moor up, row to the shore against the current, store the dinghy and walk 2 miles to Llandudno junction railway station. Therefore a mad Duchman was spotted running with 2 oars, a yellow sailing bag, muddy feet and a red dinghy upside down on his head along the quays, knocking eldery people and children into the river. As I ran onto the platfrom the train just came in and I stepped on board with sweat pooring off my face. So what seemed impossible at 11:50 was just achieved at 12:35. Nice weekend.